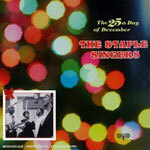 CD review: "The 25th Day of December"
If you're looking for something different than your standard Christmas carol collection, the Staple Singers' gospel-infused holiday release from 1962, now reissued on CD, is about as different as one can get while still remaining focused on Christmas. While the lyrical content of many of the dozen songs are firmly about Christmas, they have, for the most part, a Sunday morning revival meeting tone to them more so than a yuletide feel. "The Last Month of the Year," "Go Tell it On the Mountain" and "Wasn't That a Mighty Day" would all fit in comfortably at church service anytime during the year. Only "Silent Night" and "O Little Town of Bethlehem" are from the traditional holiday canon, and even here, the Staples' gospel inclinations flavor the performance. But given Mavis' soaring vocals and Roebuck's deep baritone grounding, that's hardly a bad thing.